I don’t know if it’s typical of three year old boys, or just mine, but concentration span is an issue. I do remember mum frequently asking me, when I was wee, whether I had ants in my pants, so maybe it’s typical of small children full stop. The wee man is a ball of energy. “Full of beans” is the standard nursery report. “He’s been into everything,” the creche supervisor told me today. “He’s non-stop,” my mum frequently agrees when I phone her in weary triumph, having finally packed him off to bed. But today at 5.30am I made a break through – and now I’m wondering why the hell I didn’t think of this before. I’d pulled it out in the ambitious hope it would keep him quiet until the magical hour of 6am. It absolutely did – and the best bit was I enjoyed playing with it as much as he did! The smell when I peeled back the first lid immediately awakened a very old, childish excitement and the sight of the perfect, untouched block was ridiculously tempting. We rolled and squidged and pressed and pulled and smacked and stuck the shapes together, laughing and passing the lumps back and forth, using the pots and lids and various bits of cutlery to make shapes. 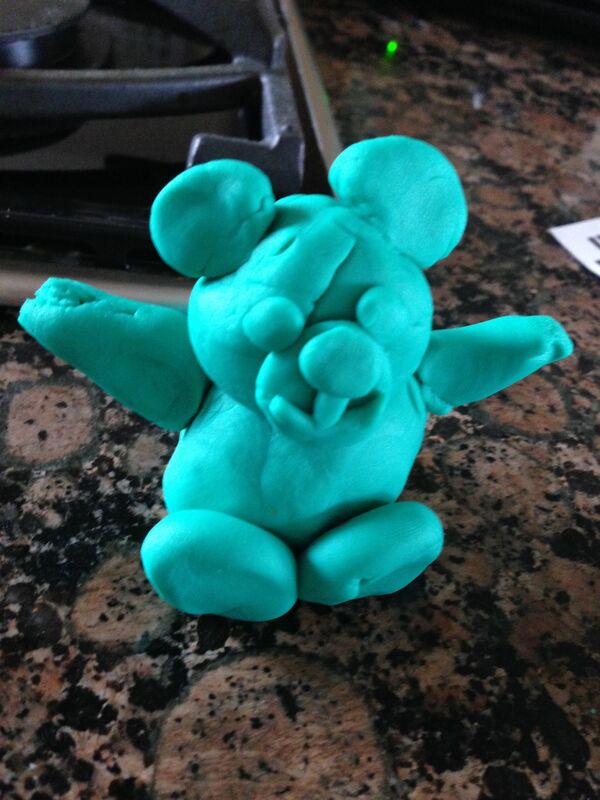 He copied my movements as I shaped the dough and gleefully destroyed all the little animals I built for him. As it began to dawn on me what a long time had passed without a complaint, I remembered a client telling me about her new product, Jumping Clay. She was using it to hold classes for children with additional support needs and had some interesting observations about the power of clay. The senses it appealed to and the concentration it inspired, the skills it helped to teach and the calmness it promoted were just some of the reasons she said it was so effective with this particular group. I was seeing first hand how universal these qualities were – we were both engrossed and happy. I kicked myself for not connecting the dots before. 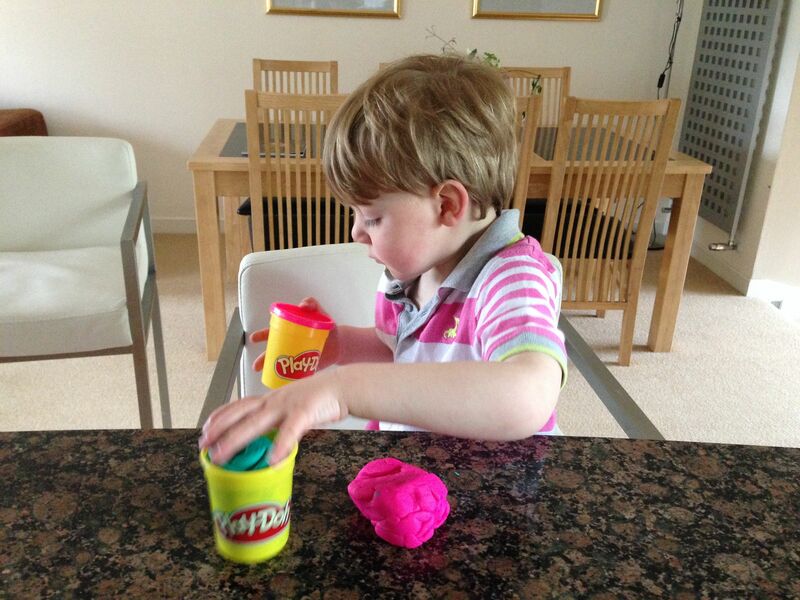 He did lose interest eventually and wander off to watch cartoons, but he came back to the table looking for the Play-Doh on three other occasions throughout the day. I need to watch he stays at the table and the wee bits don’t stray to the carpet or any other soft furnishings – and I pretty much have to sit there playing alongside him, but I’m still delighted we’ve discovered such an absorbing activity. I have now put a pot into his wee rucksack and will consider it as essential as the iPad when it comes to keeping him entertained in public places.